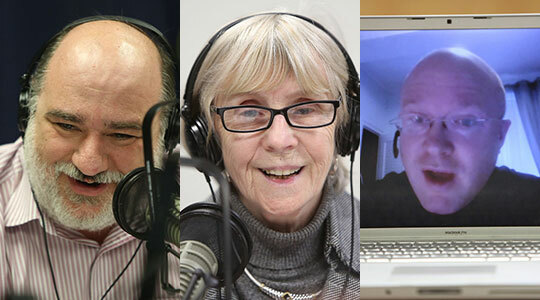 Summary of today’s show: On our weekly headline show, Scot Landry and Susan Abbott discuss the news with Fr. Roger Landry and Antonio Enrique, including last weekend’s Catechetical Congress; appointment of a pastor for the Archdiocese’s largest parish; religious freedom rally in Boston and a day of prayer and fasting; the Pope’s trip to Cuba and Mexico; and asking inactive Catholics why they left. 1st segment: Scot thanked everyone for joining us on our Thursday news show. Scot said Susan looks more relaxed this week after last weekend’s Catechetical Congress and preparing for her office’s day of prayer. Susan said her office goes away three times per year for prayer. Filling in for Gregory Tracy today who was with the Cardinal on his trip to Cuba is Antonio Enrique. Susan said the Pilot did a great job reporting on the Catechetical Congress and had many nice photos. It was a wonderful day at Boston College High School last Saturday. They had an overflow crowd. They had prepared for 850 people and even more came. Bishop Richard Malone of Portland, Maine, celebrated the opening Mass, Fr. Bryan Hehir preached the homily, and the Black Catholic Choir provided the music. Susan said she read every evaluation and people were so pleased with the 27 English workshops, 12 Spanish, and 4 Portuguese. Scot said he noticed that half of the participants were Spanish-speaking. Susan said the Spanish community is growing and Pilar de la Torre works closely with the Spanish-speaking communities and has a very personal relationship with those 20 communities that Susan and her co-worker Susan Kay can’t have with 290 parishes. Antonio, as a Spanish immigrant, said he thinks catechetics is a very important value for the Spanish-speaking community. Those immigrants tend to be very committed to their faith and are a very close-knit community. Scot said he also learned the the word catechesis comes from the word “echo” and what we’re echoing is the teaching of Christ. Susan said it’s the Greek root for echo. We’re talking about a systematic echoing of the faith. Scot said he noticed catechesis and catechist being used a lot more today than when he was younger when it was called CCD or religious education. Susan said that comes from the publication of the revised General Catechetical Directory by the Vatican in 1997. Scot said a huge focus for the Holy Father in the upcoming Year of Faith is improving how we catechize. Fr. Roger said the holy Father is much aware of a catechetical illiteracy amount adults and young adults, so we have to give the world a gift of true knowledge. Pope Benedict has always stressed that our catechesis must not be just pedagogy, i.e. instruction in knowledge, but must also be mystagogy, i.e. leading people in a way of life. Catecheists must tech by example in the practice of the faith, not just by words. Pope BEnedict is doing this with his weekly general audiences in St. Peter’s Square. Another story in the Pilot this week is the official appointment of Fr. Kevin J. Deeley as the new pastor of St. Michael’s in North Andover. Over the past several weeks we have seen three priests assigned to the parish leaving for health reasons, retirement, and reassignment to a new parish. He is the brother of vicar general Msgr. Robert Deeley. Scot said St. Michael’s is the biggest parish in the archdiocese. Fr. Kevin Deeley was is returning from service as a US military chaplain. Antonio said Fr. Deeley had recently been filling in as a temporary administrator at St. Raphael’s in Medford while their pastor was in Rome on a sabbatical. The appointment is effective April 27. Another story in the Pilot covers the Stand Up for Religious Freedom rally at the State House in Boston. Scot was one of the speakers, as well as Massachusetts Citizens for Life Edwin Shanahan, Clarivel Marin de Dragas, and State Representative Jim Lyons of Andover. Antonio said the US bishops are drawing a line in the sand to protect our right to religious liberty and to protect our consciences from being forced to violate them. Antonio was recently at a meeting between Catholic press and the US bishops conference and they are seeing this as a very important moment in the history of our country. Scot said the bishops are trying to mobilize Catholic to be much more active in the public square. Fr. Roger said we’re still in the first quarter, to use a sports analogy. We’re getting organized and rallying our resources. We’re somewhat on the defensive at the moment against those trying to curtail our rights. But the offensive aspect includes education from the US bishops religious freedom committee, which will be issuing a document on the history of religious freedom in America. Cardinal Timothy Dolan of New York has hinted at some of the content, referring recently to some of the great events in our history which were a direct outgrowth of religious faith. This education initiative will help Catholics to take the fight for their freedom and rights into the public square. Scot said the bishops are also also asking all people of faith to fast and pray for religious freedom tomorrow. Scot said Catholics need to get educated and speak up or those who are opposed to us will be the only voices in the public square. But we must also recognize the importance of times of quiet and fasting. Many of the big problems in the world have been solved by prayer and fasting. Susan said as we enter Holy Week, it’s a perfect time for such an initiative. Scot said it’s always complicated in an election when the US bishops ask us to be active in the public square. Cardinal Dolan was on Fox News’ O’Reilly Factor the other night and was asked whether the bishops were asking Catholics not to vote for Obama, and the cardinal said the bishops don’t tell Catholics who to vote for. Fr. Roger said the cardinal said if they asked the people to vote one way, they’d end up motivating some to vote the other way. Instead, they are helping people build a properly informed conscience and once they are properly formed, the obvious vote can become clear. They are certainly hoping to bring clarity to all the various issues and to show that some issues are more important than others. 2nd segment: Scot said the biggest stories this week are the Holy Father’s apostolic visits to Cuba and Mexico. He said the Holy Father singled out Cardinal Sean to thank him for helping with the building of a seminary outside of Havana. Antonio said in Boston there is a group of friends of Caritas Cubana, the Catholic charitable organization in Cuba, which means a special connection. The Pilot sent a reporter and photographer to Cuba to accompany the Boston pilgrims for a special perspective on the trip, giving a personal view of the conditions in Cuba and how their charity was received. Scot said there were some wonderful photos accompanying the articles. Antonio said they hope to have some more stories in next week’s paper as well. They had hoped to show the reality from the perspective of the reporter as she encountered it, the crumbling infrastructure, the lives of the people, and more. Susan said the articles put a human face on the realities of Cuba. Scot said the Holy Father’s message had some political content but were also meant to stoke the fires of religious belief. Fr. Roger said the Holy Father focuses on curing us of the spiritual diseases of secularism and does that wherever he goes. In Mexico, despite the deep faith of the people, there is a trend among the elites to drive the people to live as if God doesn’t exist. Similarly in Cuba, where they have had two generations of official atheism. The Holy Father said we have to recognize that the atheism in Communism has failed. Fr. Roger said he was struck by the image of one of the Masses which included a huge statue of Christ the King. In the mid-20th century when the Mexican government was trying to exterminate the Church, theory of Viva Cristo Rey, All Hail, Christ the King was the cry of the martyrs. Pope Benedict was using this image to show that the Christian faith cannot be killed off. Christ is always persisting in all those places. Scot noted that Fidel Castro requested a private meeting with Pope Benedict. Antonio said it’s impressive to see how Fidel, who took the Church out of Cuba with his revolution, went to see the Pope and reading the reports of the visit, he was struck by the question Fidel asked the Pope about how the Mass has changed from his childhood. Fidel is realizing how much the Church has changed since he was a boy practicing his faith. It shows the person behind the public persona and perhaps he’s reconsidering his life as he gets older. Scot noted that the Missionaries of Charity has a charism where one of the sisters prays for a particular priest every day. One Cuban sister was assigned to pray for Cardinal Joseph Ratzinger 25 years ago and they finally got to meet during this trip. Fr. Roger said this was a practice started by the Carmelites and Mother Teresa picked up many of the practices of the Carmelites. Fr. Roger said there was a Missionary of Charity in New Bedford who prayed for him every day. He said many cloistered nuns are co-workers in the ministry of the priests they pray for every day. Scot said many of the Pope’s addresses can be found at the website of Zenit.org. Scot said in another story John Hancock Financial gave a gift of $1 million to Pope John Paul II Catholic Academy in Dorchester to be given over five years. Scot said the editorial in the Anchor refers to an article that was in America magazine in which a program of performing exit interviews of Catholics who abandoned the practice of the faith was discussed. Fr. Roger said they found a consistency in the reason why the people gave up. Some were on nonnegotiable issues, such as teachings that cannot be changed, but it’s not just a rejection to he teachings. Sometimes people were looking for an explanation and a better way to understand it which wasn’t provided. Some people said when they asked for a conversation, instead they got back flat statements. There were also negotiable issue the Church could do on: empty” homilies detached from daily life, uninspiring music, an insatiable focus on raising money, an inadequate response to the sexual abuse of minors, the sense that Church was simply a place to attend Mass lacking a true community spirit, an absence of consultation and transparency in Church administration, “arrogant” and “aloof” priests,, and so on. So the authors’ hope was that the Church could address what could be fixed in order to encourage people to stay. Scot said there’s a beauty in understanding where people are at and to help become formed, to gain understanding, to be enlightened. Susan said one of the saddest comments was that when they left the parish no one noticed, nobody called them, and nobody asked why. People wanted a community, wanted to be involved and couldn’t find a way. Scot asked all listeners to make people know that we care when we see them at Mass each week.